Go to File → Import → Network → Public Databases... (image ). 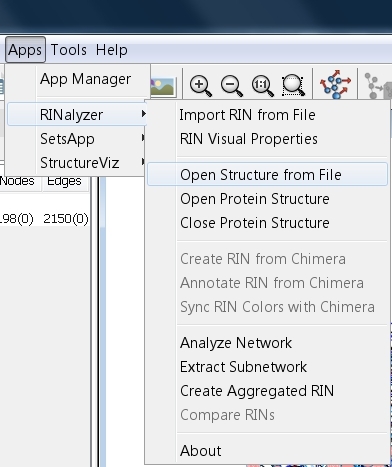 In the Data source drop-down menu, choose the RINdata Web Service Client (image ). 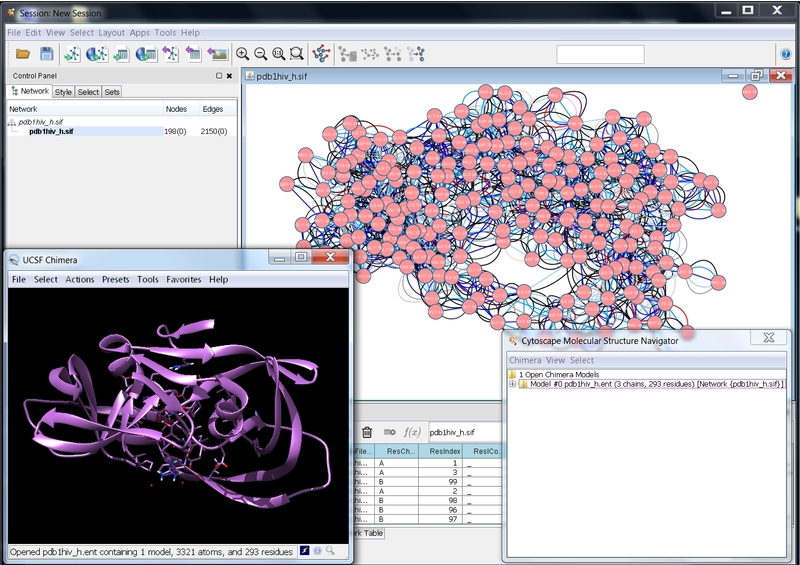 Enter a PDB identifier in the search form (image ). 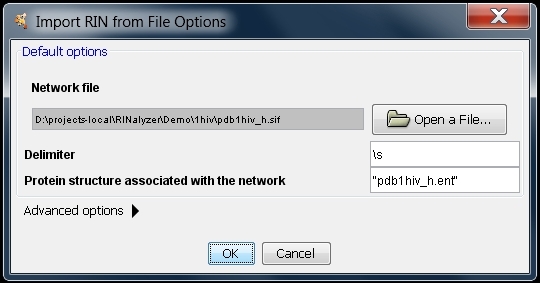 If UCSF Chimera is not installed in the default location and it is your first time to use this service, enter the path to the UCSF Chimera executable (image ). 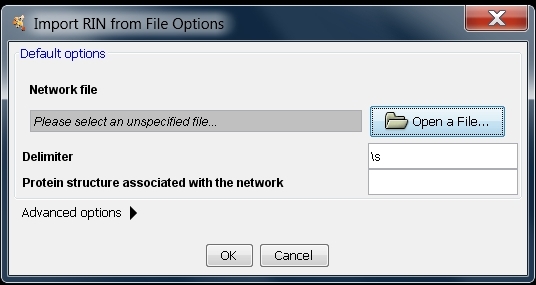 The network and edge attribute files are loaded automatically. 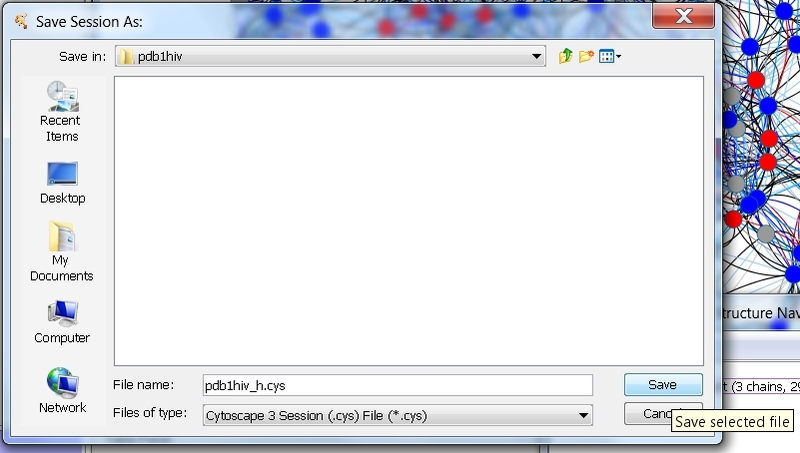 The structure file is saved to USER_HOME/CytoscapeConfigureation/pdbs/ and opened in UCSF Chimera. 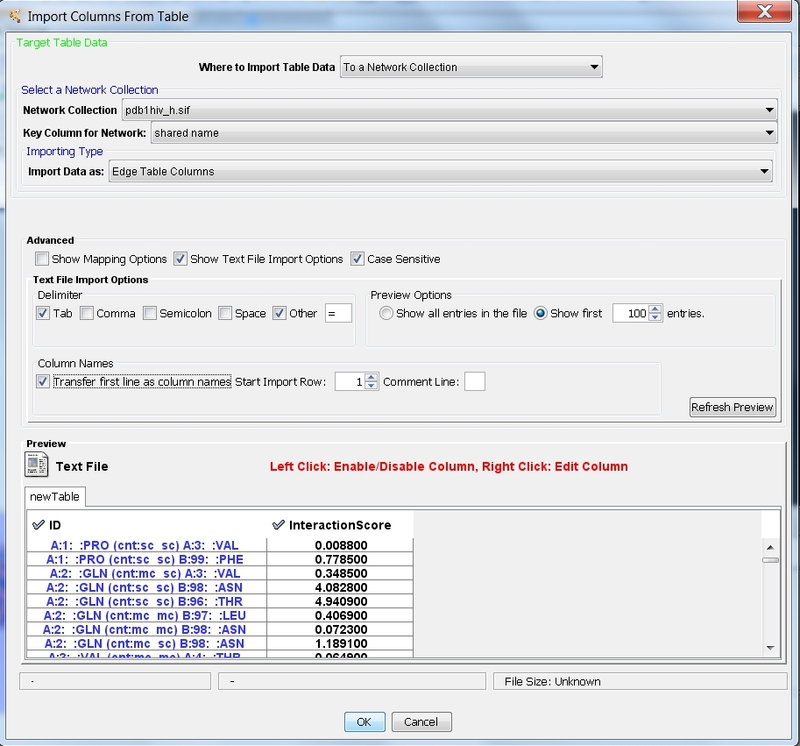 The default visual properties and the RIN layout are applied automatically. Your screen should look as in this image . 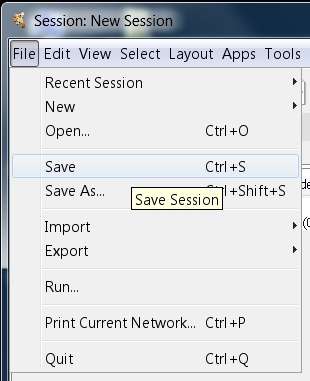 If you are do not want to import other RINs, close the dialog using the X button in the upper right corner (image ). 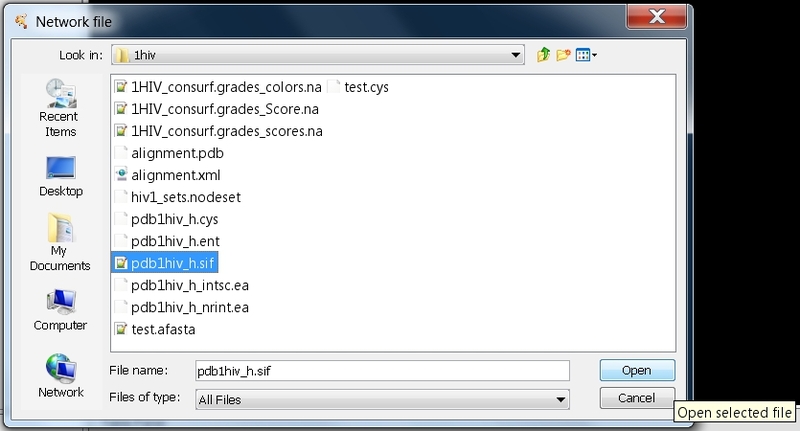 Click the Open a File... button (image ). Go to the 1hiv directory that contains the RIN files. 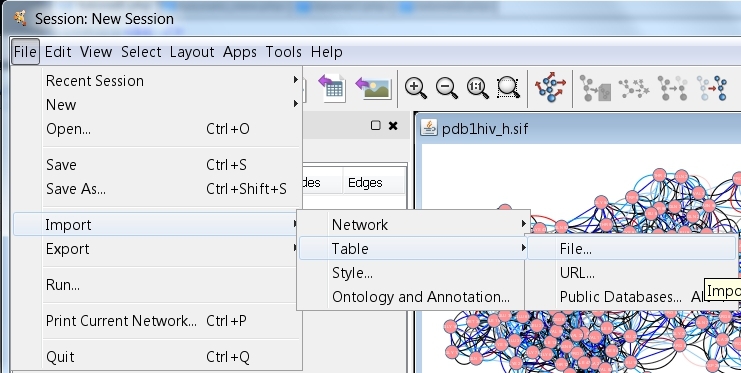 Select the file pdb1hiv_h.sif in the file browser and click on the Open button (image ). 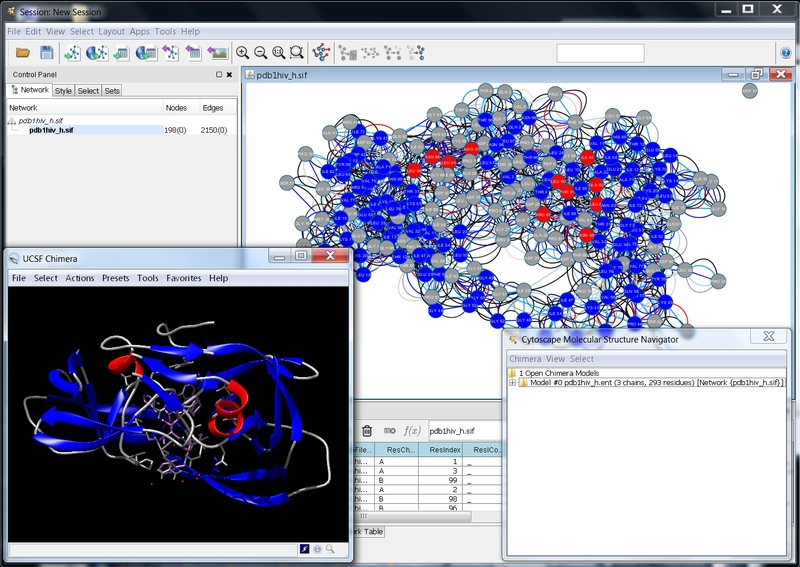 Enter "pdb1hiv_h.ent" for the name of the structure associated with this RIN (image ). 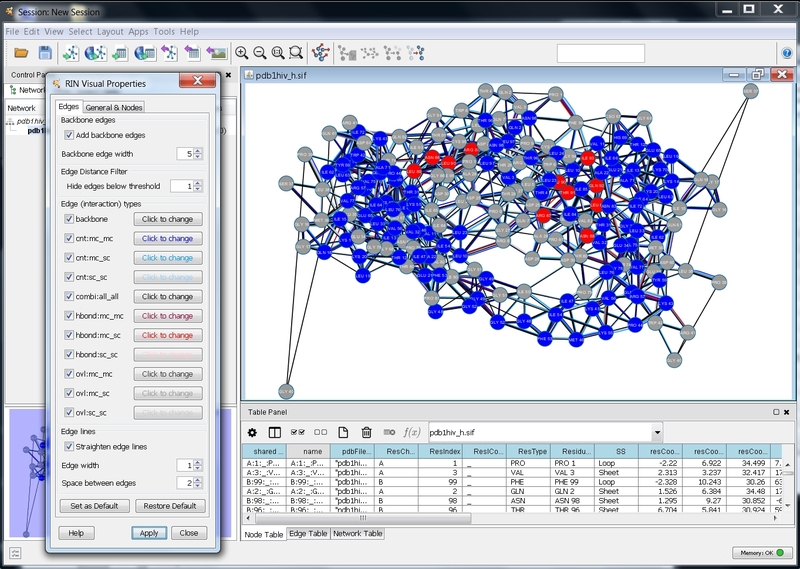 Click the OK button to load the data into Cytoscape. Your screen should look as in this image . 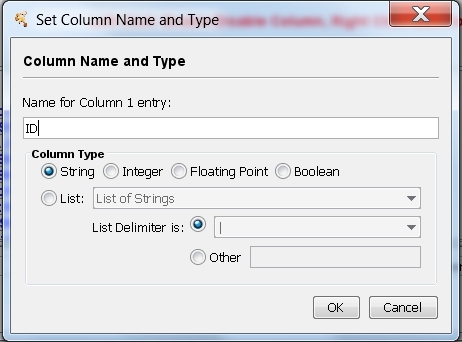 In the Import Columns from Table dialog, choose Edge Table Columns in the Import Data as drop-down list, check the Show Text File Import Options checkbox, choose the option Other and enter = for Delimiter, check the option Transfer first line as column names (image ). 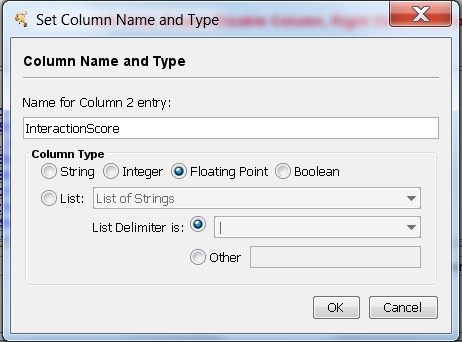 To set the column names, right-click the column names and enter the new names, ID for the first column (image ), InteractionScore for the second (image ). 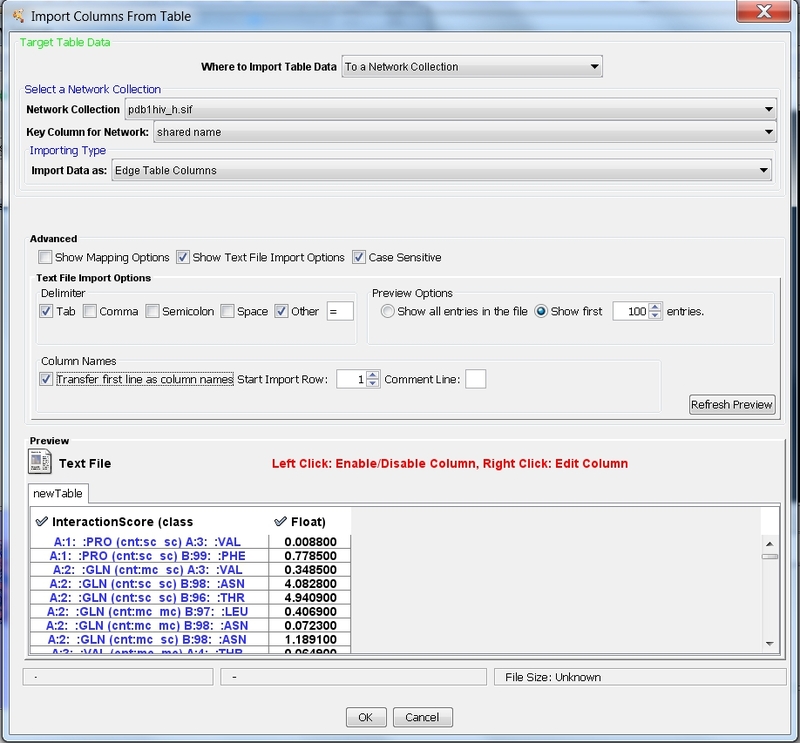 In everything looks as in this image , click OK to complete the import. Go to Apps → RINalyzer → Annotate RIN from Chimera (image ). 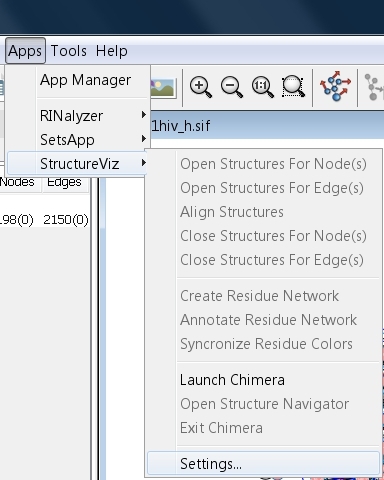 Select one or all (by clicking Ctrl + A) residue attributes to be transferred as node attributes (image ). Go to Apps → RINalyzer → Sync RIN colors with Chimera (image ). 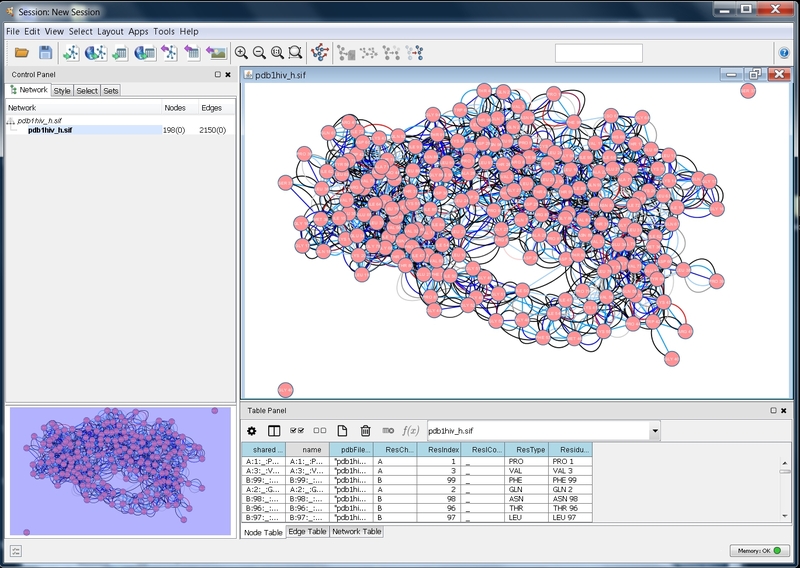 Choose the first option to transfer the colors of the nodes to the residues (image ). 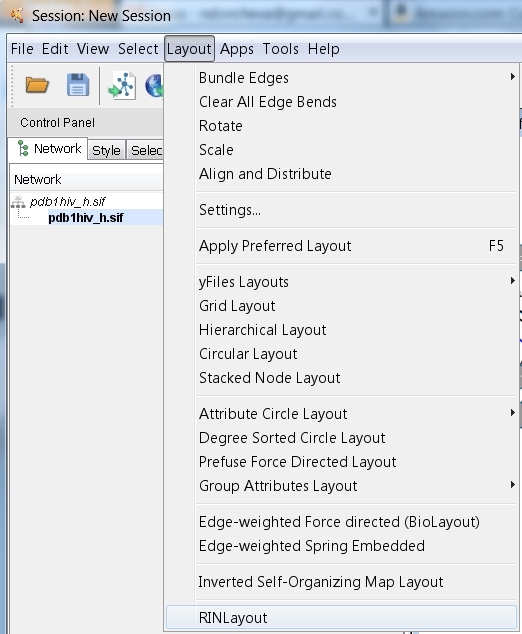 Rotate the 3D structure and to layout the network according to the 3D view, go to Layout → RINLayout (image ). 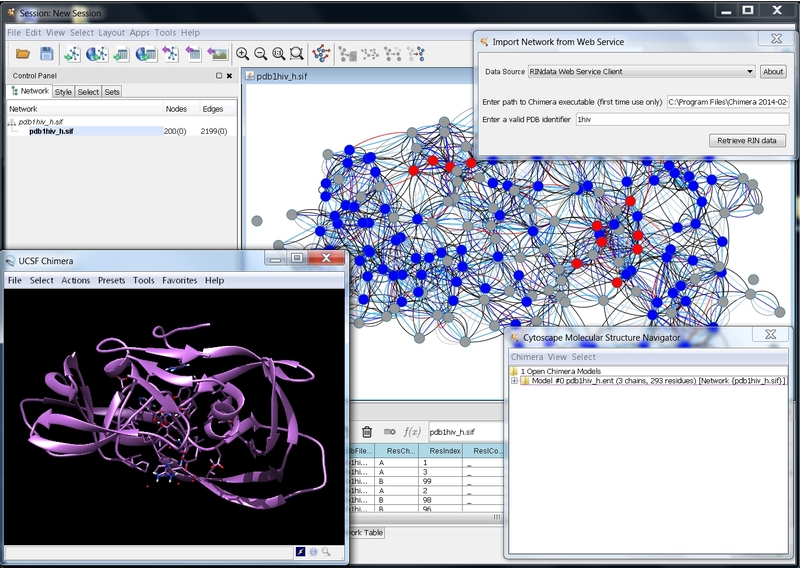 In order to see the whole network click on the 1:1 (image ) icon in the Cytoscape toolbar. 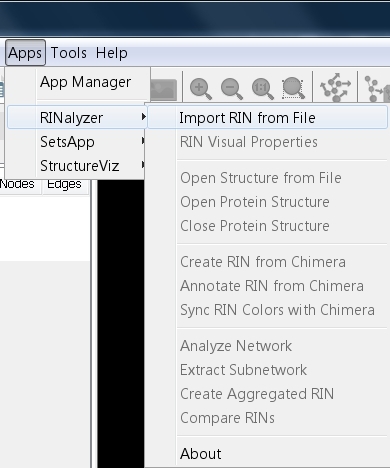 Go to Apps → RINalyzer → RIN Visual Properties (image ). 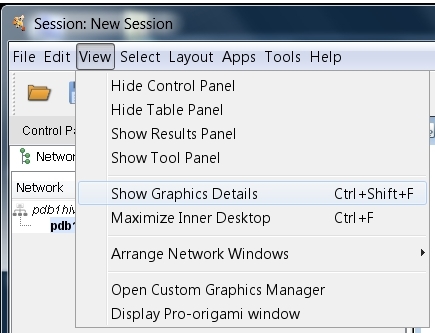 You can add backbone edges by checking the box on the top of the dialog (image ). In the Edges tab, you can enable/disable the option Straighten edge lines if you do (not) want multiple edges to be drawn as straight parallel lines as in this image . 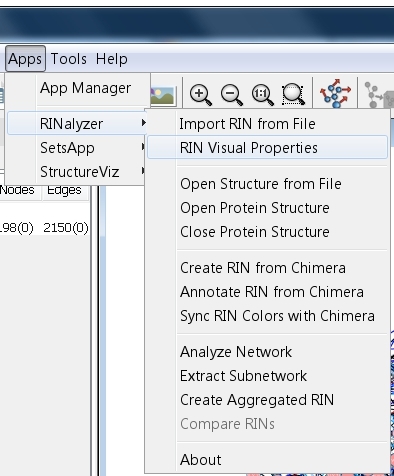 If you are satisfied with the view of your RIN, apply the changes by clicking the Apply button and close the dialog with the Close button.